1. The quote from the book, “Your journey to becoming a Happy Muslim will go back and forth. You will feel like you have improved yourself (progressed), and then you will feel like you have regressed/ gone backward. This is totally normal. Going back and forth is part of the journey to becoming the best YOU possible,” best summarizes the essence of this book. The author does a great job reminding us that happiness is not a single step but requires effort and involves setbacks, which are a normal part of the journey. 2. For me it was an eye opener, if we as Muslims could combine the knowledge of those who call towards the Quran and Sunnah coupled with the knowledge and expertise of dealing with spiritual, mental and emotional matters, we would be a better people. 3. How to Be A Happy Muslim, Insha Allah. While the world is witnessing unprecedented scientific advancement, and an explosion of material and technological growth, the Muslim world is engulfed in flames of wars, destruction, senseless killings and sectarian strife. Many Muslims are living in an unhappy atmosphere of violence, hatred, pain and suffering. In view of the prevalent discourse of Islam, which has reduced it to be a one-dimensional political ideology, Muslims find themselves confused and clueless about the road ahead. At this dark hour, Sheima Sumer’s book How to Be a Happy Muslim is a ray of light and hope. Through this book Sheima Sumer has beautifully undertaken the task of reinvigorating and redirecting the discourse of Islam to its real purpose of being a source of achieving individual felicity, joy and happiness–paving the way for a happy society and a happy humanity. She has succeeded in creating a step-by-step guide that shows how the practical application of timeless and sacred Islamic teachings coupled with modern health ideas and techniques of counseling form the ingredients of How to Be A Happy Muslim, Insha Allah. Sheima Sumer is uniquely qualified to write this book. In addition to her academic credentials, education from various Islamic scholars, and her professional work experience, she has also been an active community worker and a practicing Muslim all her life. The challenges and tests of family life have also enriched her by finding happiness and contentment in connection to Allah (Subhanahu Ta’allah). Sidi Syed Zain Al Abedin is the founder and president of ISRA (The Islamic Studies And Research Association). His family roots connects him to the Holy Prophet Muhammad (saws) through Imam Husayn Radi Allahu ‘Anhu. He is the co-founder of several Islamic organizations in America. Currently he also serves as a voluntary Imam and Khateeb in South Carolina. He has lectured and participated in many national and international conferences. 4. The book How to be a Happy Muslim draws on resources from psychology, health and nutrition, the Quran and Sunnah, and personal stories to provide readers with clear tools to make positive improvements in attitude and behavior. It is a short and comprehensive guide presented in an easy to read and personal way. How to be a Happy Muslim is designed to provide encouragement to Muslims who wish to improve both their outlook and approach to life. Modern Muslims caught up in demanding jobs, consumerism, and other trappings of contemporary societies will benefit from the author’s advice. Happiness is an important aspect of spiritual, emotional, and physical health and is presented wonderfully in this book from the Islamic perspective! 5. Happiness should be a priority, not because we are selfish, but because we want to be our best possible selves. A calm attitude, emotional control, and a resolve to solve problems rather than remain stuck in them can help us to focus our attention and energy so that we may thrive in our work, our relationships, and our lives, and be the people that God created us to be. How To Be A Happy Muslim is a recipe book for inner peace replete with practical advice for simple but effective ways to encourage physical, mental, and spiritual health. While written explicitly for Muslims, many of these recipes can be “tweaked” for non-Muslims as well. As a Christian, I share not only Mrs. Sumer’s belief in the all-Merciful God, but her conviction that it is faith in God’s mercy that makes an underlying contentment possible in a world of challenges and difficulties. Accordingly, many of these exercises are designed to increase happiness by way of bolstering faith, not because faith alone can make the problems of the world disappear, but because faith reminds us that the final outcome is in the hands of the One who is Most Compassionate, Most Merciful. However, there is also advice within these pages that can be shared with anyone regardless of religious belief. My hope is that readers will keep this book in a prominent location so that just a quick glance at the title will help them remember that happiness is important, worth striving for, and attainable regardless of outside circumstances as long as one is willing to put forth a conscious and consistent effort. 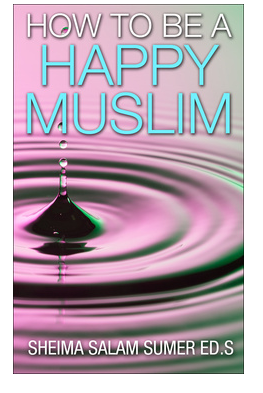 A fabulous resource for a well-rounded life, How To Be A Happy Muslim is worth consulting again and again! 6. As a follower of Jesus (Isa), I might use different types of prayers to talk with God, but I have the same desire to love, worship and serve Him sincerely. I have benefited from the practical and thoughtful recommendations and life style changes presented in this book and so commend it to Christians and Muslims alike. I think we all can see that the world could only benefit from a few (or a lot) more “happy” people of faith, Lord willing…and ones who in a world of rising tension, are able to engage in honest, humble conversation across the different lines of faith. 7. This is an honest and casual approach to a very important topic. The author uses her insight and experience along with key references from the Quran, Sunnah and modern sources to give a concise, easy to understand manual to happiness. By coaching the reader with clear directives, she is able to bring the poignant and practical notions of Positive Psychology and connect them to their roots in the path of Islam, thus giving Muslims access to many powerful and useful tools from solution-focused counseling that are often misunderstood as being foreign concepts. This short book is a wealth of information and direction for a contemporary world in dire need of a clear way to understand that being Muslim can and should result in being a happy person. 8. This book is an exceptionally accessible self-help and self-improvement guide for Muslims as well as a valuable resource for mental health professionals working with the Muslim community. It integrates ideas from Islam with therapeutic techniques to provide a framework for dealing with challenges in one’s life. Sheima Sumer uses simple, yet critical aspects of Islamic teachings and connects her readers to relevant techniques and theories in counseling that are complementary to Islamic practice. The book pulls together religious practice and psychological well-being (defined as happiness) in a manner that is supportive and instructive. Sumer is candid and provocative in her use of personal stories to highlight how she has applied these principles in her own life. The book is structured in an easy to read format using excerpts from the Quran and Hadith alongside practical advice. I found the book to be extremely relevant, engaging and abundantly full of depth. I would highly recommend How to Be A Happy Muslim Insha’Allah: Rise Above your Problems and Choose Inner Peace and Joy with Ideas from the Quran, Sunnah, Counseling and Health Fields . 9. The book is an excellent reminder and summary of the ways we can each begin taking charge of our lives and our feelings. I’m sure that this book will be helpful to many people during tough times or as a jumpstart to making a positive change in their lives. 10. Technological progress was meant to make our lives easier but somehow we find ourselves being immersed in all sorts of problems that we never knew in the previous decades. The solutions that the world has come up with have only made matters worse and we see an increased tension in the air… the whole world seems to be in a rush as if gripped by some unseen monster who has made them forget why they are rushing in the first place? The result is an ever increasing sense of dissatisfaction… anxiety… fear and helplessness. Outwardly people seem to be enjoying the luxurious lifestyle, but inwardly there is a sense of loss and deprivation. But how to get out of this trap? How to feel bliss, contentment, peace and inner strength and satisfaction? How to feel REALLY and TRULY… Happy?